I have always believed that every map tells a story. When it come to exploring a geographic narrative, there are no better vehicles than 20th century illustrated maps. In the second of our series of guest posts from Dutch author Arjan den Boer, here are the introduction and link to his fascinating article on pictorial rail maps. Be sure to click on the link for access to the entire story and other equally absorbing and erudite articles on European rail travel and cartography. In the mid-20th century pictorial maps in cartoonish styles were a popular way of promoting travel and tourism. In contrast to objective, realistic maps they appeal to emotions such as romance, fantasy and humor. They are used to tell anecdotes about a region’s history, culture and landscape in a way attractive to old and young. 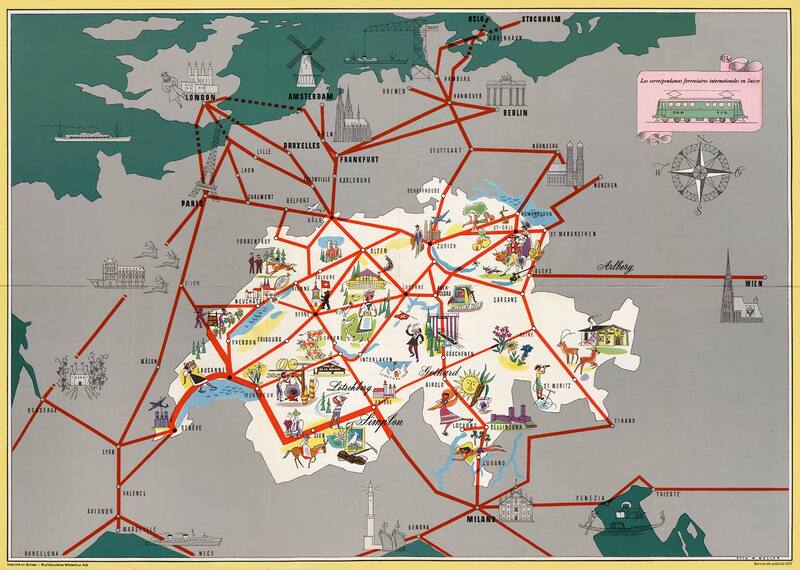 These illustrated maps are meant to inspire, not to provide travel information.Pictorial maps or Bildkarten seem to be the opposite of the schematic metro-like maps of railway networks from the same period, composed of straight lines and without any details. Schematic and pictorial maps share one thing though: they are only loosely bound to geographic reality. Their common goal is to convey a message — either the straightforwardness of a journey or the attractiveness of a region. This entry was posted in Animation, Art, Europe, History, Maps, Public Transport, Tourism, Travel Writing and tagged Cartography, Cartoons, Europe by Rail, Illustration, railways. Bookmark the permalink.